PharmaMOP® Head for application of large volumes of disinfectant cleaners to ceilings, walls and floors. Ideal for meeting extra-long contact time requirements to control spores. 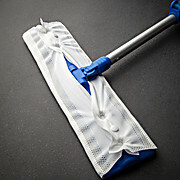 Polyester over foam construction provide abrasion-free mopping for ISO Class 1-7 cleanrooms.